This story was kindly submitted by Ted’s Great-Grandchild Jamie Currie, and published here with permission. Edward (Ted) Clack was born in Highworth, Wiltshire on 4th June 1896, to Maggie and Charles Clack. The 1901 census shows him living with his parents at 61 Hinton Street, Highworth, along with his older brother William. Despite working as a Mat Weaver in a local factory from a young age, Ted was a very keen footballer, and played for the Highworth Town Football Club. 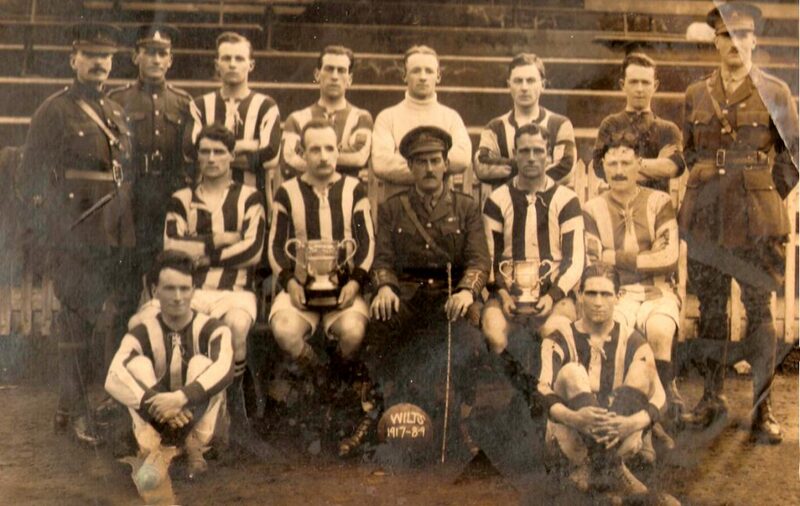 His team were so successful that in 1913 they won the Swindon & District Cup. He would go on to have a successful career as a professional footballer – but once the war broke out in 1914, Ted’s passion had to be put on hold. 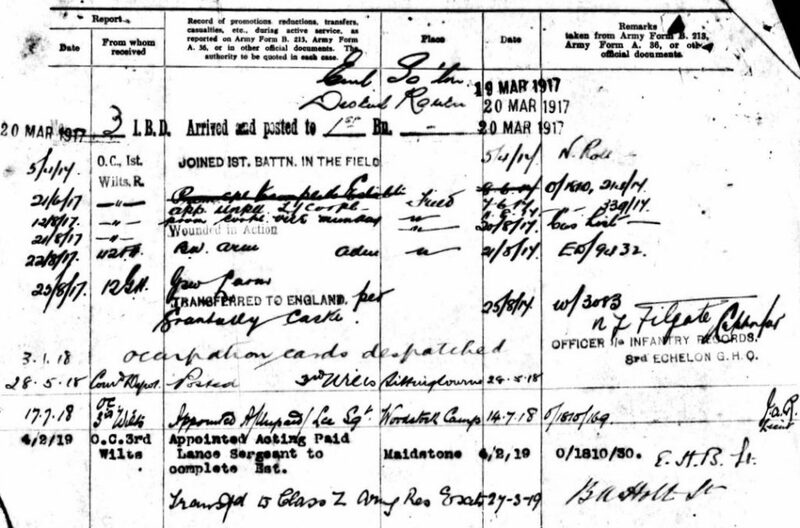 He enlisted for the Army at Devizes in August of 1914, aged 18, being posted to 5th Battalion the Wiltshire Regiment. Unfortunately, 1 year later (to the week) Ted was shot in his left leg whilst on the front lines at the Gallipoli peninsula, Turkey, and sent back to England to recover. 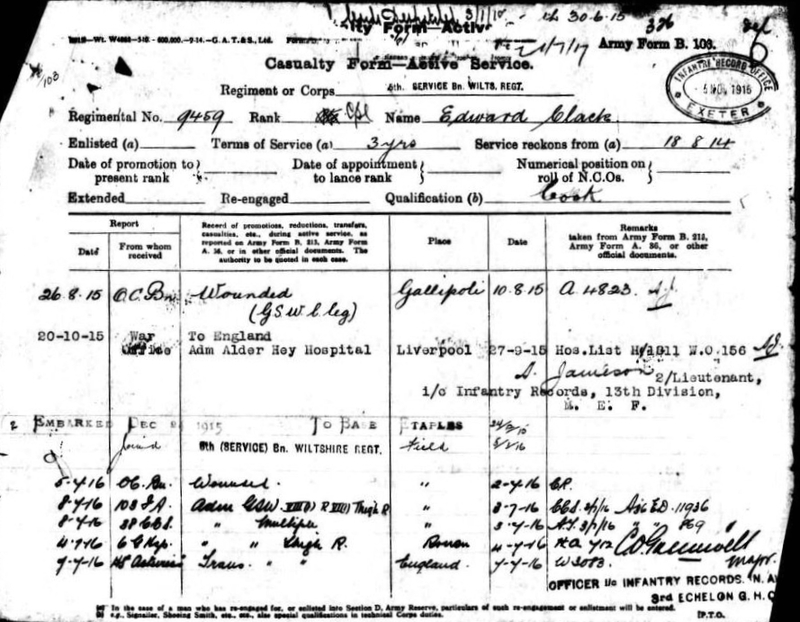 Just 4 months later, he was up and able, and sent to join the 3rd (Reserve) Battalion stationed in France over December of 1915. We can see from the above below that even with a serious leg wound, Ted couldn’t be kept from playing for his regimental team! However, come January 1916 he was transferred to the 6th (Service) battalion, which was positioned in the Neuve Chapelle area of France and engaged in trench warfare. A week after the start of the Battle of the Somme the battalion took part in the capture of La Boiselle, moving into Mametz Wood shortly after. August was not Ted’s lucky month, and during these manoeuvres he was again wounded, being shot in both his thigh and shoulder. Given the nature of the war, Ted had no choice but to carry on. Taking just 7 months of recovery time, he joined the 1st Battalion in March 1917, playing an active role at the battle of Messines. Fortunately Ted came out unscathed – even being promoted to Lance Corporal for his efforts. This relative good fortune wasn’t to last, however, and in August of 1917 Ted was again shot at Pilckem Ridge, this time in his left arm. For his bravery with the 1st Battalion, he was awarded the Military Medal, and steadily promoted to Lance Sergeant by the time he was officially discharged in 1919. 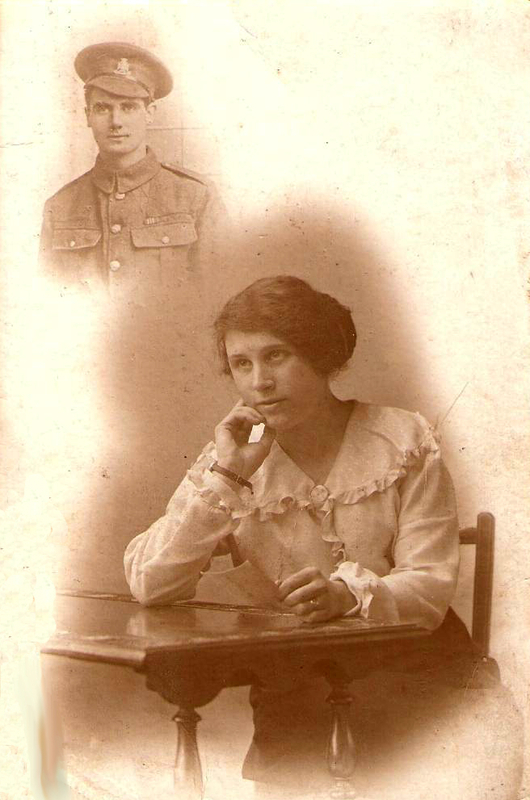 Ted married his sweetheart Martha ‘Madge’ Hayes in December 1917, and they went on to have two sons. William Edward (also known as ‘Ted’) was born in January of 1919, and later served almost 20 years in the Royal Navy. Norman was born in September of 1928, and went on to serve as a Royal Marine. Ted’s passion for football never left him, and after the war, despite his many injuries, he resumed playing – this time professionally. In 1921-1922 he played in the position of Outside Right for Sunderland FC. In 1923 he moved to Bristol City FC, and continued to be involved with teams at Nuneaton Town and Hinkley Town. In his older years Ted worked as a Storekeeper, and his relatives remember Ted as a quiet, gentle man who loved his allotment and the nature around it. They never heard him speak about the war, or even lose his temper: such clear testament to the resilience and humility of a man who’d seen and experienced so much. Ted Clack died in 1984 in Cirencester, and is remembered fondly by his family. Thank you for posting this, Ted Clack was my grandad affectionately known as Pop. I owe both my grandparents a lot for what they taught me about life and the nature that surrounds us. Pop would have been proud to see what you wrote but as he was such a quiet man, rather embarrassed. Thank you again for caring about those that risked their lives so that we could live in freedom. You’re very welcome Sylvia. From what I know of him, Ted seemed such a decent man, and one dedicated to making his contribution to the war. I would’ve loved to have met him! It was a pleasure to hear his story and share it here – and I know many others will enjoy learning about Ted and his amazing life. Thank you for taking the time to read and comment, Sylvia.